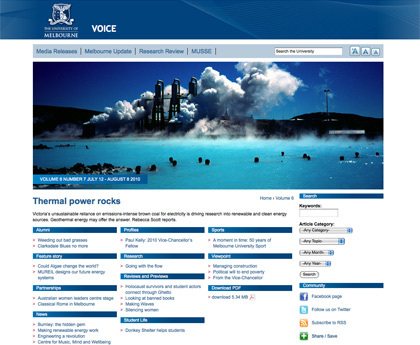 Voice is the newspaper of the University of Melbourne. It is published monthly and is distributed on the University’s campuses, published as a supplement to the Age on the second Monday of each month and is available online and by free email or hard copy subscription. Each month Voice explores a major social issue in which University academics and researchers contribute to public debate. Voice also contains research news, informed opinion and analysis, alumni news and profiles, stories on student life and activities, Arts reviews and previews, sport, previews of multimedia programs and listings of Public Lectures and other events.